Europe NATO (KFOR) G16 from former Jugoslavia. G16 EMD C0-Co 1800 hp. Photo from the magazine "Editoriale del Garda Sede Legale": via Annunciata, 65 25015 Desenzano del Garda - Brescia - Italia. On an older issue of the same magazine there was a picture of a G16 in use by Croatian (or Slovenian ?) Railways -they use former Yugoslavia State Railways rolling stock. 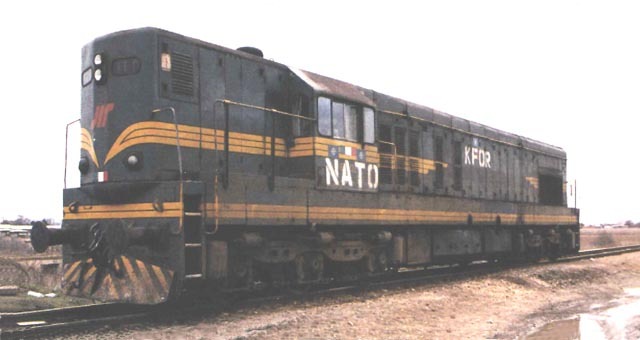 The same engine had some TV coverage during the forced exodus of Kosovo-Albanian people. I recall to see it pushing the people crammed coaches outside the Kosovo border.